February 17th, 2016 by alexandra kuskowski | Comments Off on Happy Reading Week! 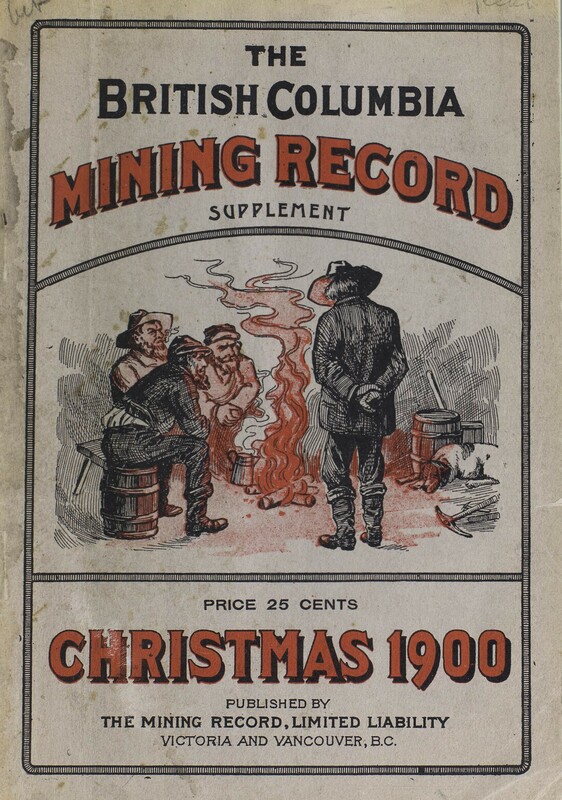 Posted in Back In My Day.., Digitizers' Blog, Exploring Open Collections | Comments Off on Happy Reading Week! 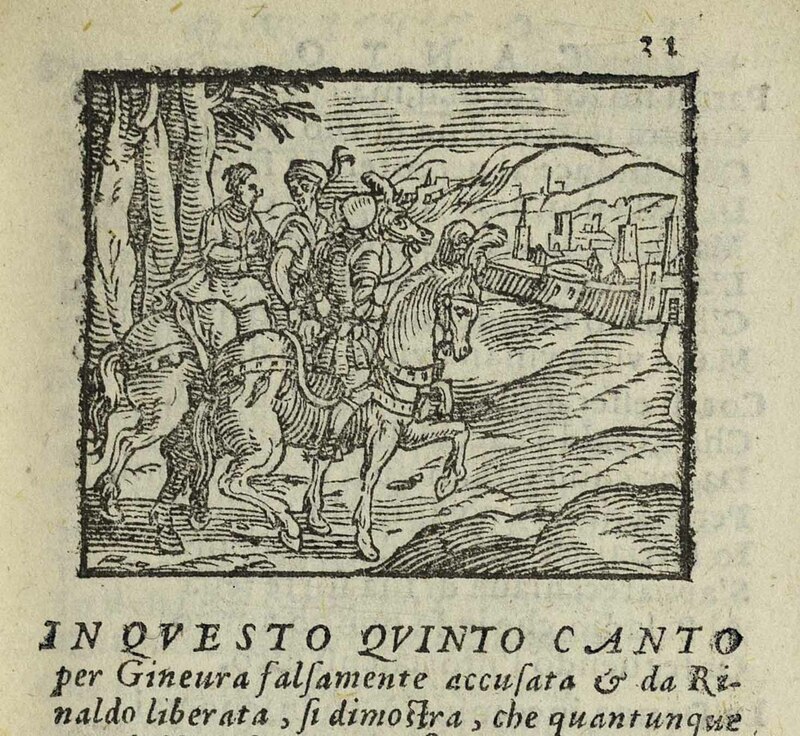 Forget watching Star Wars, Avengers, and Lord of the Rings on your cellphone– if you are looking for a larger-than-life story delivered to you in a small container check out our newly digitized epic poem Orlando Furioso in Western Manuscripts. The full size of the book is only 11 by 5 cm. This preciously small package packs a punch though! 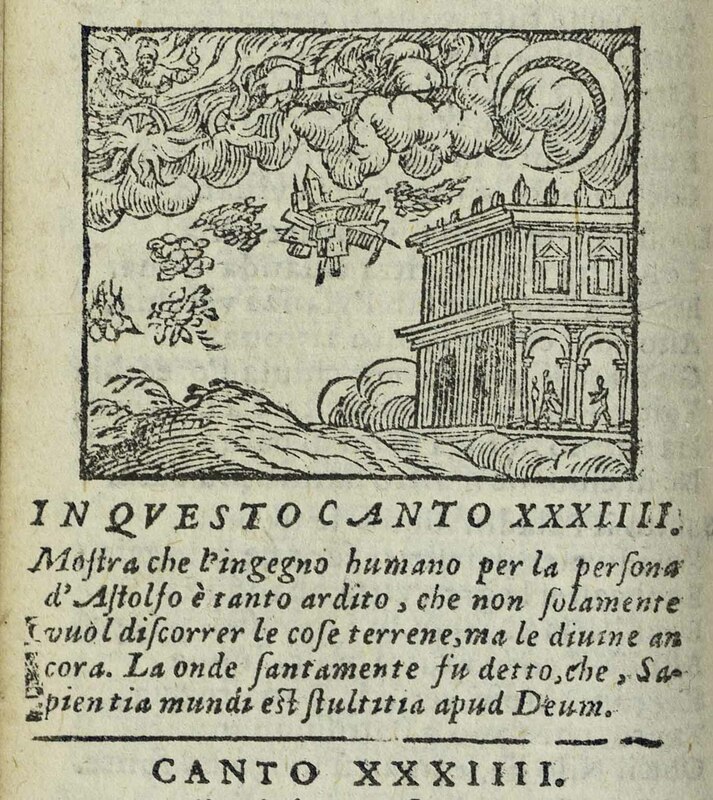 Orlando Furioso is an Italian epic poem written in 1516. 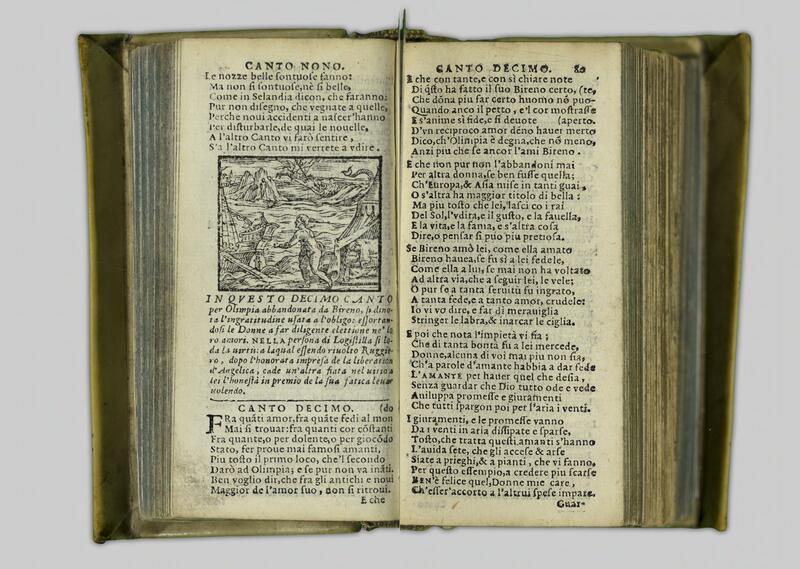 With 46 cantos (or chapters) this is one of the longest poems in literature. 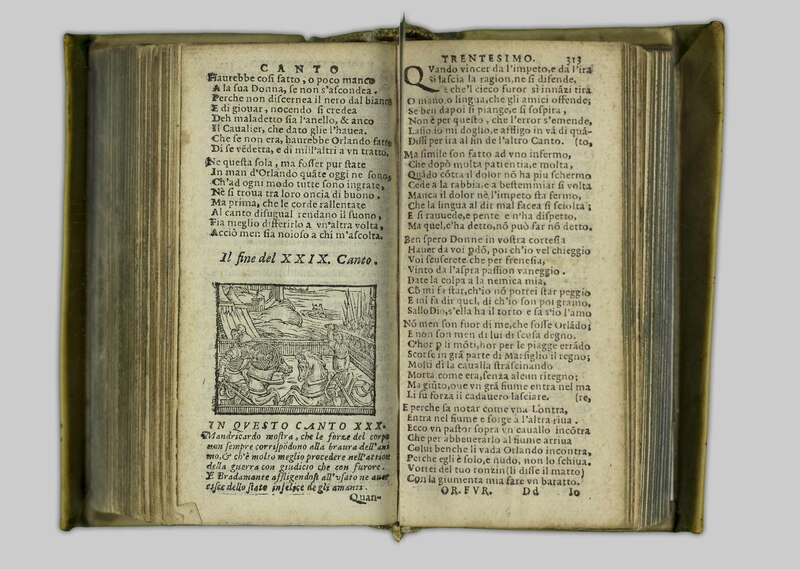 Our version, one of the earliest, was published in 1577. The poem follows Orlando, a singular knight involved in the war between Charlemagne’s Christians and the Saracen army that attempted to take over Europe. The setting ranges over the whole world, with a trip to Hell and the moon thrown in! As befitting any epic there are also soldiers, sorcerers, gigantic sea monsters, and even a hippogriff. This is the Canto where the main characters go from Hell to the moon. Hard to tell which one it is from this picture! The poem focuses romantic chivalry, especially on Orlando’s love for a princess, which among other things drives him into a mad killing frenzy – romantic enough for Valentine’s day? A female knight is also one of the main character of the poem. Here she she is taking down a foe! For us the tiny, tightly bound book was a challenge to digitize. Not only was it old, small, and fragile- the print often goes very close to the center binding, making it difficult to get a complete picture of for digitization. Can you spot the sea monster in this canto? So check it out for your self to see what all the fuss is about! 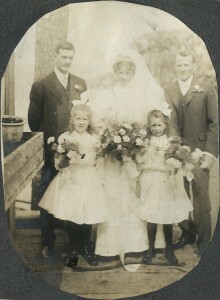 One of the best things about Open Collections is the amazing amount of images and items focused on the local area. It’s easy to look back in time. Our Now & Then blog for example is a fun way to see how the UBC campus has changed. 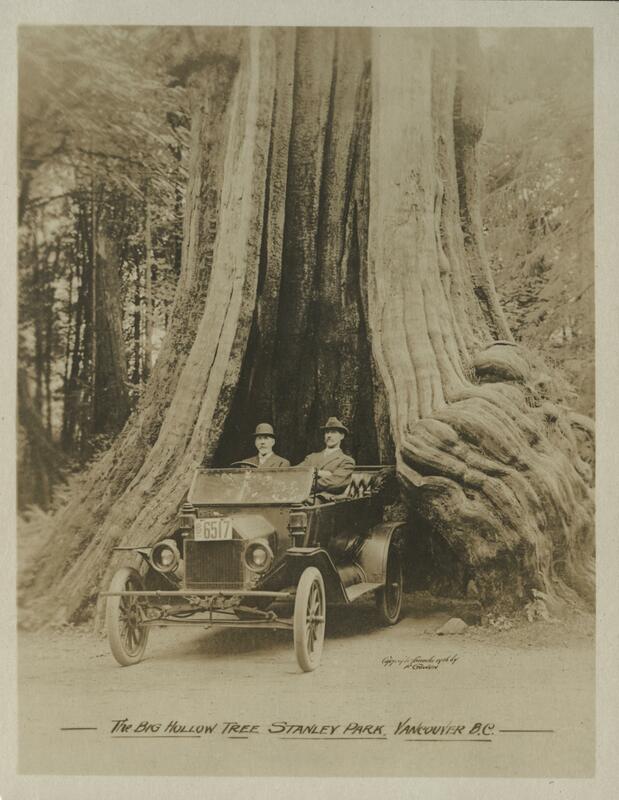 We’re turning our time machine to another beloved local landmark, Stanley Park. The park, which was dedicated over 125 years ago in 1888, has been a gathering spot long before settlers arrived. Originally home to First Nations peoples the park land has evidence suggesting habitation up to 3,000 years ago. At the turn of the 17th century the settlements of Whoi Whoi and Chaythoos were removed to make was for the development of the area. 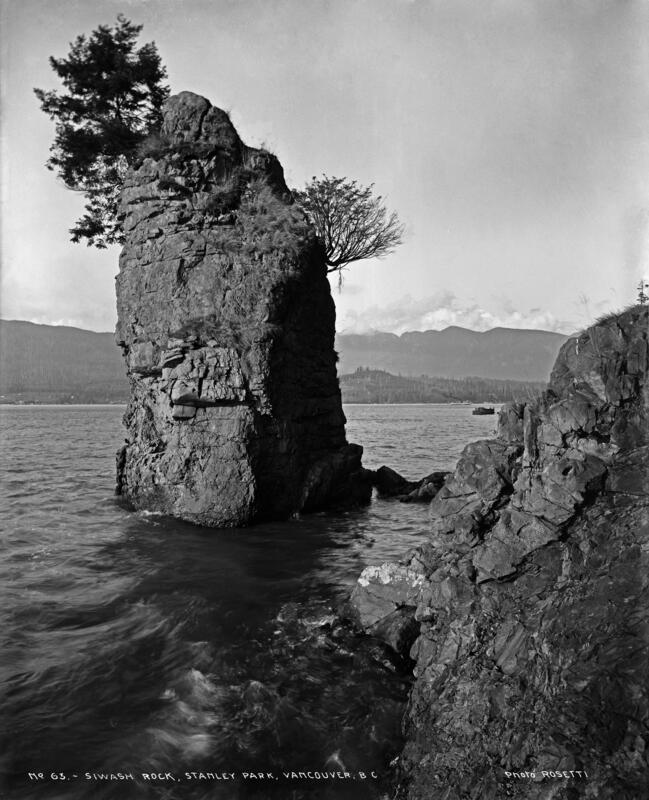 The landmark of Siwash Rock, located near Third Beach, was once called Slahkayulsh which translates to he is standing up. Oral histories relate to story of a fisherman was transformed into the rock by three brothers as punishment for immorality. Much of the park is still densely forested. 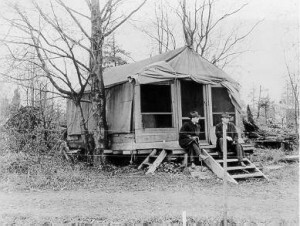 With half a million trees it’s close to what it was in the late 1800s. 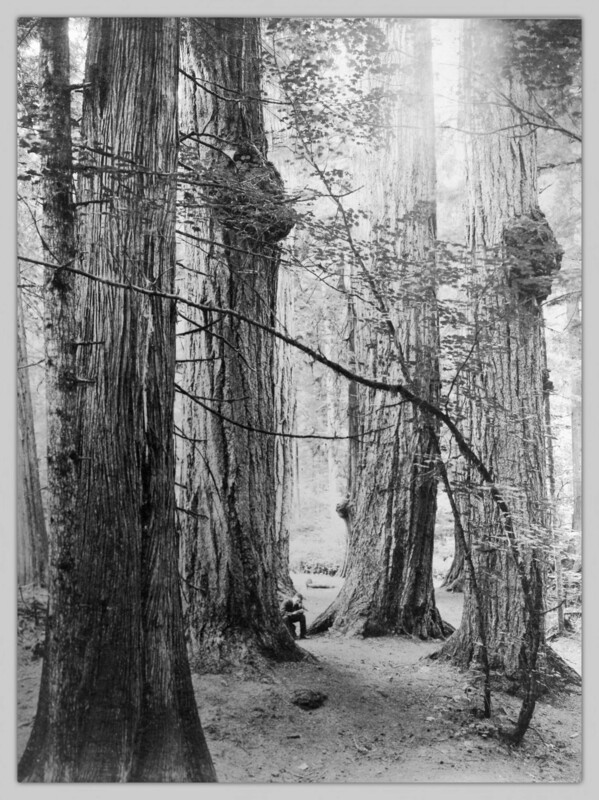 Some of the trees, which stand as tall as 76 meters (249 ft) and can are hundreds of years old. Can you spot the men in these pictures? They are worthy of a ‘Where’s Waldo’ photo! Many trees tourist attractions and have been for over a hundred years. Take for example the Hollow tree- which still exists in the park! 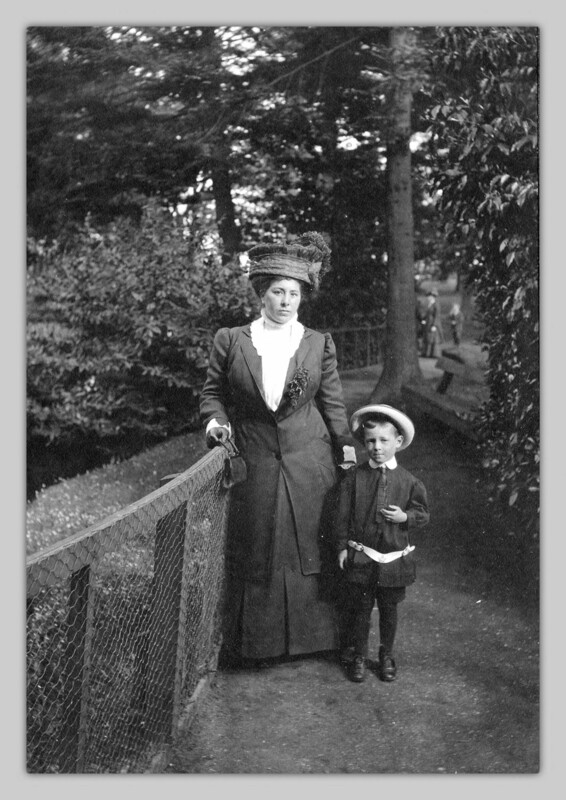 Here’s a photo from over 100 years ago! 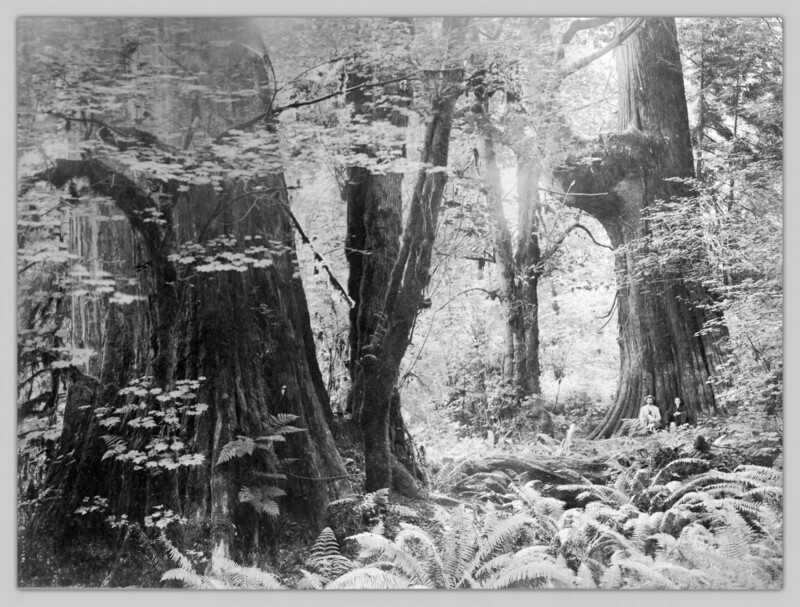 One famous tree landmark that is gone now but can still be seen in our photo collections is the Seven Sisters, a grouping of seven enormous trees. Legend has it that the trees were seven kind souls lined up to protect visitors from an evil soul embodied in a white rock. So, if you have an hour or two get dressed in your Sunday best and see the park for yourself! 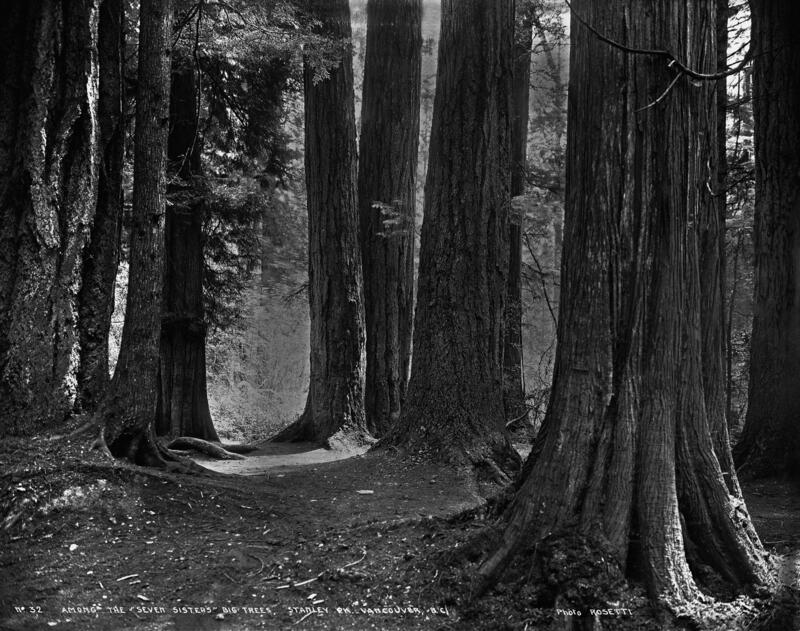 Or explore the history of Stanley Park through Open Collections. Hope you are all enjoying the holiday break. We compiled a few items for your to peruse from our collections that run in the holiday spirit. Click on any image to see it closer or download it. Hope you enjoy! Check the date of this post Friday November 13. A special day for Triskaidekaphobes, people who fear the number 13. Traditionally, in the Western world any Friday the 13th is considered unlucky. Are you freaked out? If you are, you’re not alone. Recorded fears start as early as the 19th century, but some say the practice may date all the way to the middle ages. Today many people avoid trips, traveling and any number of activities- with an estimated 80 million dollars lost in revenue in a single day. Considering there is at least one and as many as three Friday the 13ths in a given year, that’s pretty significant. This post isn’t about freaking out people dislike the most feared date of the year though, it’s about exploring the past! 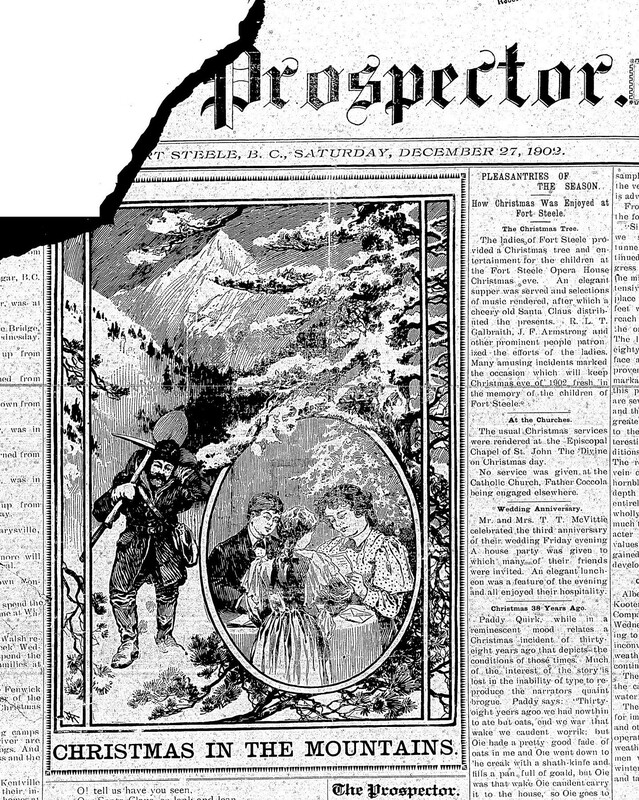 In the past 115 years there have been sixteen Friday November 13ths – a lot of which we can explore in the BC Historical Newspapers –and use them to discover cool features on Open Collections! 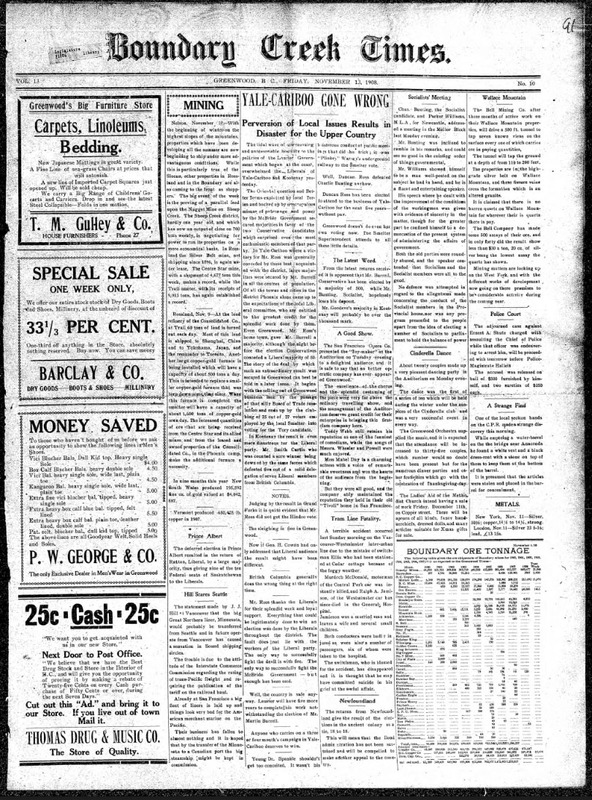 To see any of the papers in more detail – click on the image to go to the listing. 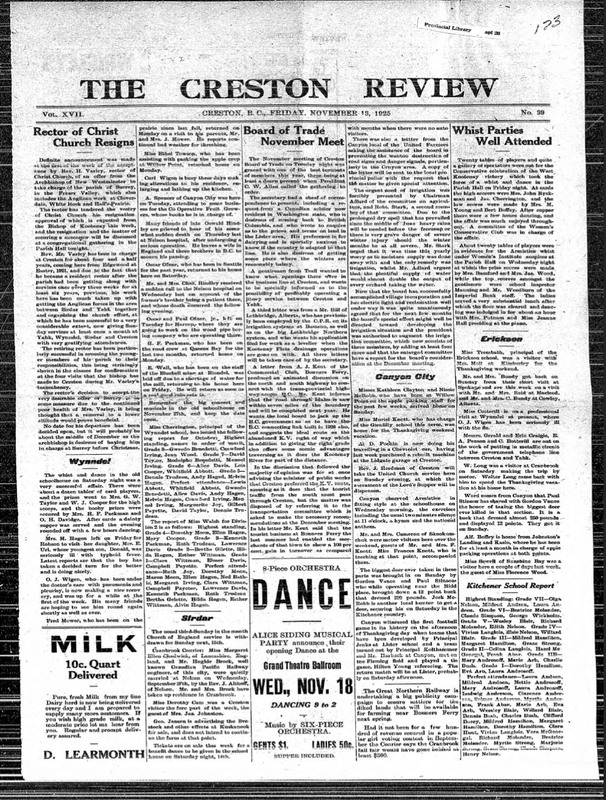 First up: The daily newspaper the Boundary Creek Times on Friday November 13, 1908. That type is a little small. You can toggle to the full text by clicking the paper image on the upper left hand side. Even better, compare the type and the paper picture by clicking the open page diagram! 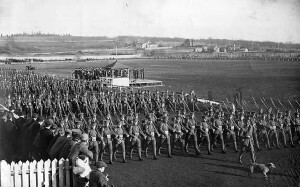 Friday November 13, 1914 shows the first world war is had begun. The cartoon in the center of The Western Call has an interesting take on modernity too. Note the King’s Speech in the bottom corner! If you want to save the page click on the download button with the arrow on the upper left hand corner. It will only download the page you are on, not the whole paper. By Friday November 13, 1925 things have cooled down. 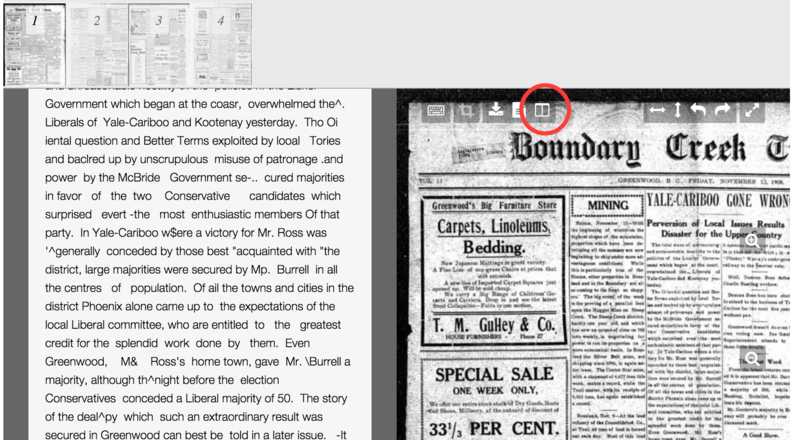 The Creston Review reports that people were able to attend whilst parties – as detailed in the upper righthand corner. Checkout the Creston Milk at 10c a quart! What a steal of the deal! Last bust not least take a quick peek the Ubyssey from Friday November 13, 1953. The anti-red commission makes the headlines – suggesting the Cold War and fear of communists was in full effect. Some other cultures point to Tuesday the 13th (Hispanic and Greek) or Friday the 17th (Italian) as bad luck- but that’s a post for another time. UBC Centennial- Where Did it All Begin? 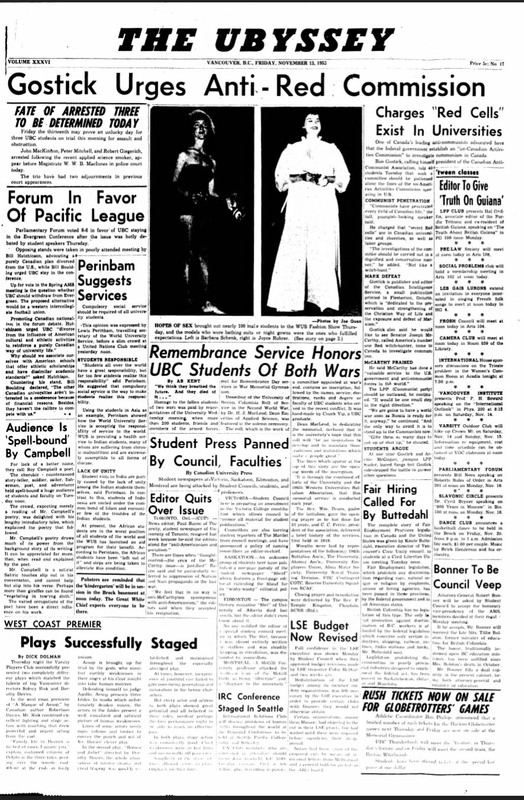 October 1st, 2015 by alexandra kuskowski | Comments Off on UBC Centennial- Where Did it All Begin? 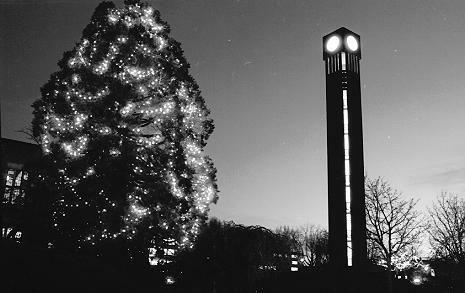 UBC had a centennial birthday yesterday! 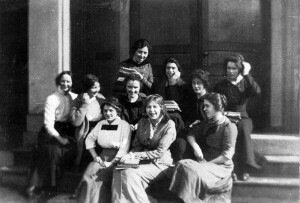 On September 30th 1915 the University of British Columbia held the first lectures for the newly formed University. To celebrate this momentus occasion we’re taking a look back here on the blog at DI. Memories abound all over the campus and beyond. 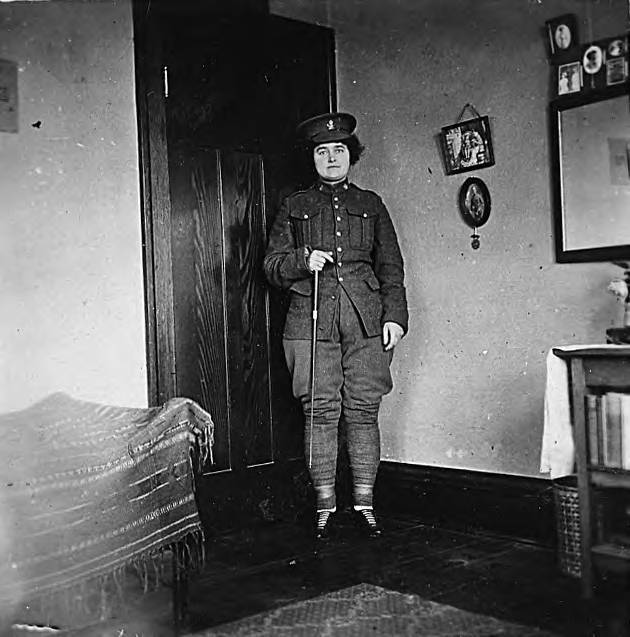 Check out some of the amusing, amazing, even astonishing photos of what else was going on in the year 1915. Click on the pictures to see even more. This is the first and second buildings on what would become the UBC campus taken in 1951. 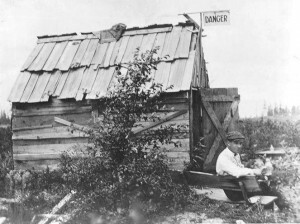 Check out that sign on the first building– “Danger” is right! 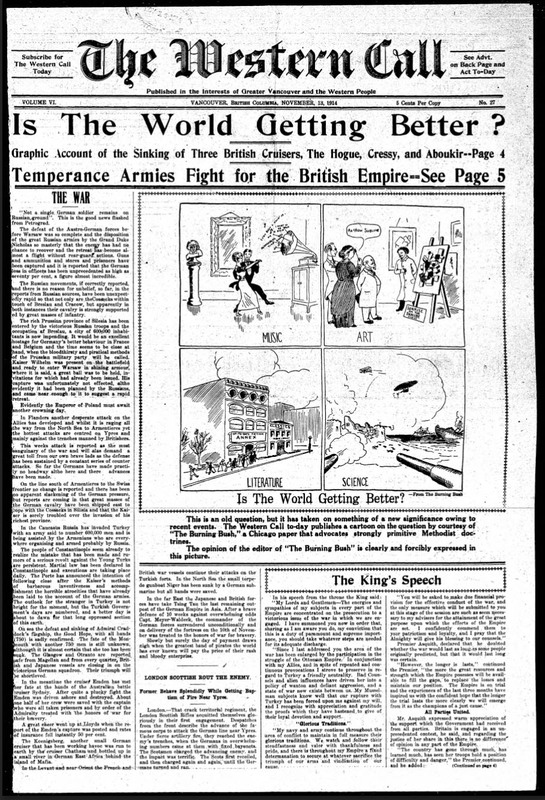 The year 1915 was also a major year in WW1. 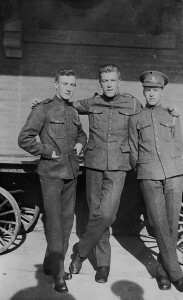 Many people were volunteering for the army, being shipped overseas, or participating in the war effort however they could. 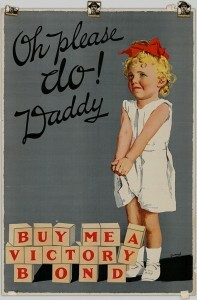 The common citizen would have seen a lot of posters for Victory Bonds- bonds sold by the government to support the war effort. 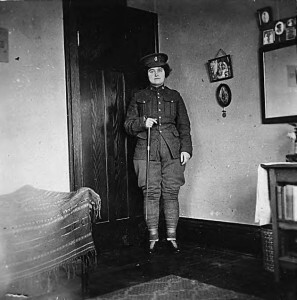 Both men and women volunteered as soliders involved in the war effort. 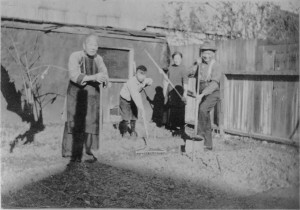 At home people kept on living- getting married, working, and gardening- and of course, going to school! 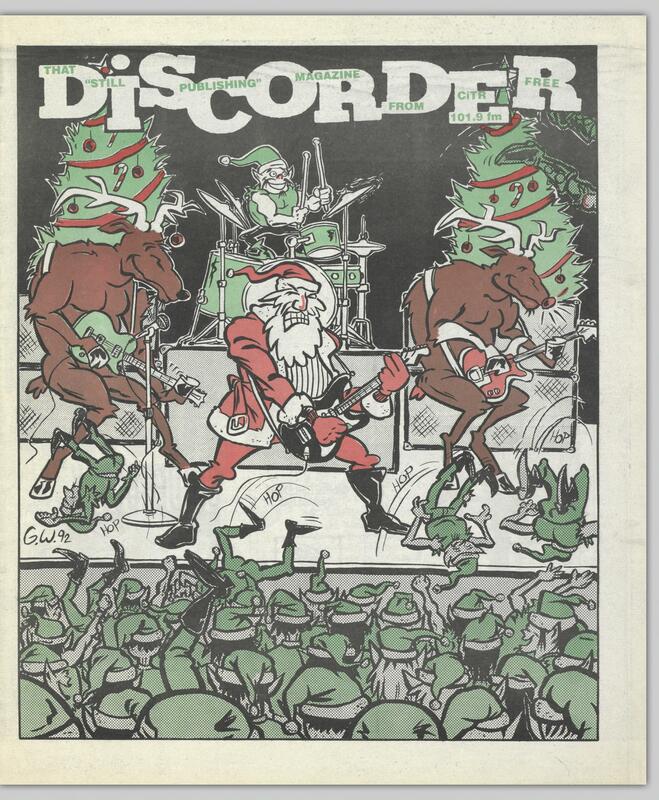 Posted in Back In My Day.., British Columbia, digital preservation, Digitizers' Blog, UBC Library @ 100 | Comments Off on UBC Centennial- Where Did it All Begin? 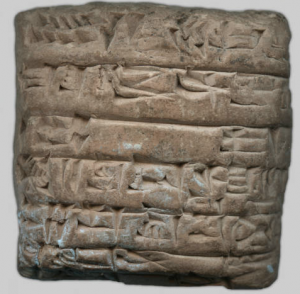 Made in partnership with Rare Books and Special Collections and the From Stone to Screen project, the cuneiform tablets are among the most ancient objects Digital Initiatives has ever digitized! The tablets are part of Ancient Artefacts collection, which also includes Egyptian papyri. Receipt by a temple official of “one sheep and one lamb on the thirteenth day of the month” for rent- Can you believe those prices?! Puts Vancouver to shame. Considered today to be one of the most significant cultural contributions by the Sumerians, cuneiform is one of the earliest known systems of writing. The RBSC tablets were created during the 20th century BCE, between 2029 – 1973 BCE, over 4,000 years ago. 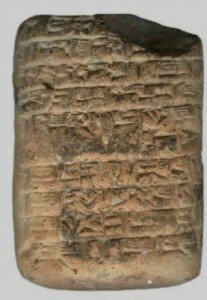 Cuneiform translates to “wedge shaped” from the Latin word “cuneus” meaning wedge and refers to the shape of the writing. The marks were often made with a reed. It replaced the pictorial style of writing from the 31st century BCE to about the 1st century CE. Another rental receipt – Rock receipts are starting to seem very handy- what if you get audited 1,000 years from now? By the 2nd century CE the script had been replaced with Phoenician alphabet, and all knowledge of how to read the script was lost until the 19th century. Most of the found cuneiform tablets have not been translated, as there are few qualified individuals in the world. Luckily here at UBC, we have qualified individuals willing to translate the ancient script. Today we can say they were written in Sumerian. Where they came from? That’s another story. Determining the provenance is not easy and is sometimes impossible. Provenance is a tricky thing especially when the items in question are thousands of years old. It’s made even trickier by people lying in order to give an object a history it doesn’t have, or even those with good intentions but inadequate or misleading information. Which is exactly what happened with the history of these tablets. Want to know the misinformation, lies, and mysterious history behind these tablets? Stay tuned for Part 2 next week!